This is Post #5 in the 2019 Home Trends to Watch Series. See Post #4 here. 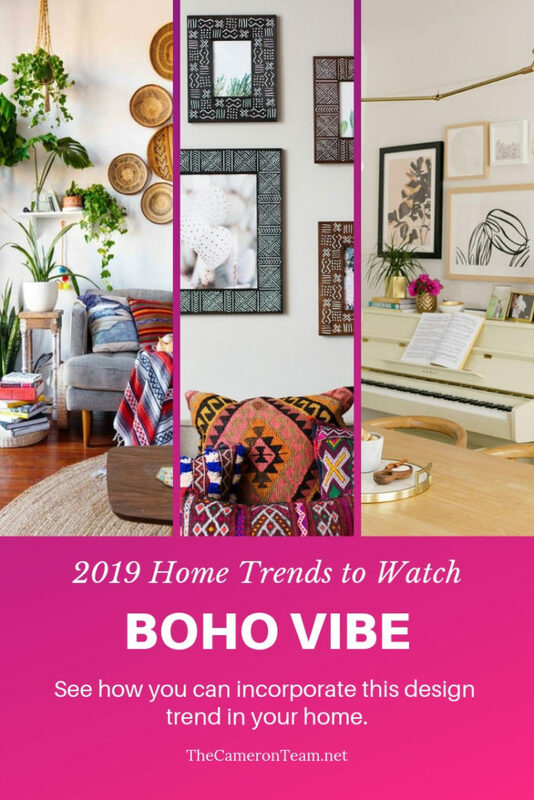 As we continue our 2019 Home Trends to watch series (inspired by ELLE Décor’s The Design Trends That Are In and Out in 2019), we are roving into the eclectic melting pot that is Boho Vibe. It’s a complete contradiction to the straight-forward, simple themes of recent years and encourages homeowners to fill their spaces with a collection of patterns, colors, fabrics, textures, and vintage pieces. Boho originally referred to travelers in the eastern-European region of Bohemia. The nomadic Bohemians led unconventional lives of creative artistry and often adopted fashions from the countries they visited, so their style was a mix of different cultures. Boho interiors reflect this approach and exhibit a touch of chaotic design. However, in this recent return, there’s organization to the chaos. Boho is more modern, refined, and vibrant – but still an amalgam of cultural styles. We’ve compiled some examples and resources to help you incorporate the Boho Vibe in your own home. Take a look below and remember, if you like what you see, you can always click through to the source to view more information. It’s a great way to discover new designers, blogs, and home decor stores. Jewel tones are big right now, and they mesh well with Boho Vibe, so don’t hold back on the color. If that’s not normally your thing and you want to just slip your toes in the water, consider including one colorful, bold element while still incorporating textures and patterns in subdued colors. A good example of this is Alexandra’s master bedroom reveal. She has a dark teal accent wall that makes a bold statement, but the rest of the room is mostly subdued. 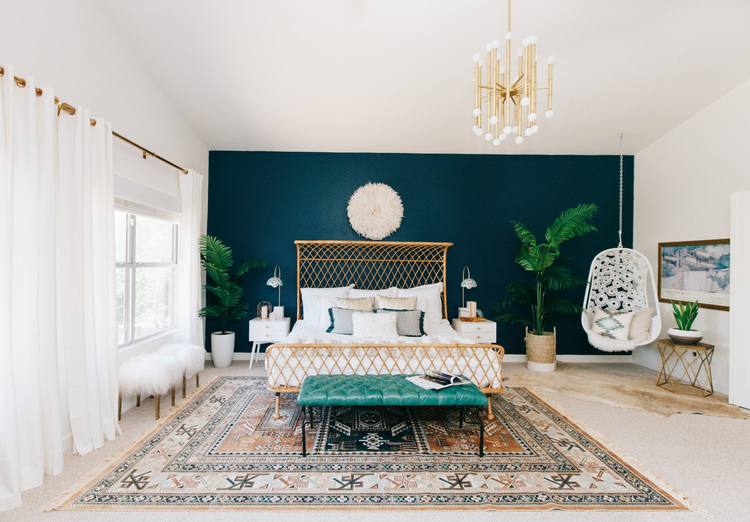 Ruffles, faux fur, rattan, and a juju hat provide interesting textures while a rug, hanging chair, pillows, and pots add the element of patterns. Here and there, the teal reappears as a secondary color, like in a pillow or the rug, and that helps to pull the room together. But, overall, the palette is very simple. After flooring and paint, furniture is the foundation of a room’s decor. From there, you can build up with pillows, lamps, and accessories. Natural materials are a primary component of Boho design. So, when choosing furniture for the room, look at solid wood, rattan, teak, seagrass, reclaimed wood, etc. Try to avoid plastic. Metal is the next best option. Of course, if you’re looking for a fully-upholstered couch or sofa, a bright color follows the standard Boho template, but you could always go neutral and pile it up with brightly colored pillows. For an example of this, check out Matt and Beau’s Boho living room on Old Brand New. Notice the wood tables and wood legs on the upholstered couch, which is a pretty low-key color. The rest of the room is very colorful, but the natural elements help to ground it. Make sure you check out the pictures from the remainder of their home for even more ideas. If you’re updating the lighting in the room, you can go multiple ways, but the most popular option is natural materials. Imagine you’ve just travelled across Europe and shopped in small markets here and there, what light fixtures would reflect that? Think handmade with attention to detail. Chandeliers constructed from wooden beads and large pendant lights made from woven bamboo are examples of this. Stylist Manda has a great little compilation of Boho Pendant Lights to check out. Brass is also an option for those who want to add a touch of shine to the room. 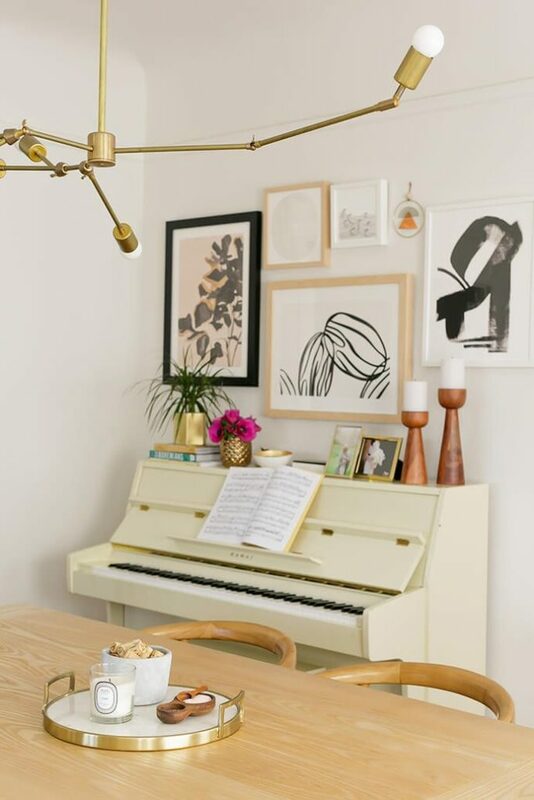 The irregular brass chandelier in Monica Wang’s Boho dining room is one example of this, and if you’re a fan of Modern Boho, take a look at the remainder of the pictures of her home. The Glitter Guide has a nice spread. Plants, especially hanging ones, appear often in Boho styled rooms. That may not be good news for those of you lacking green thumbs…Spsst! Fake plants work wonders. 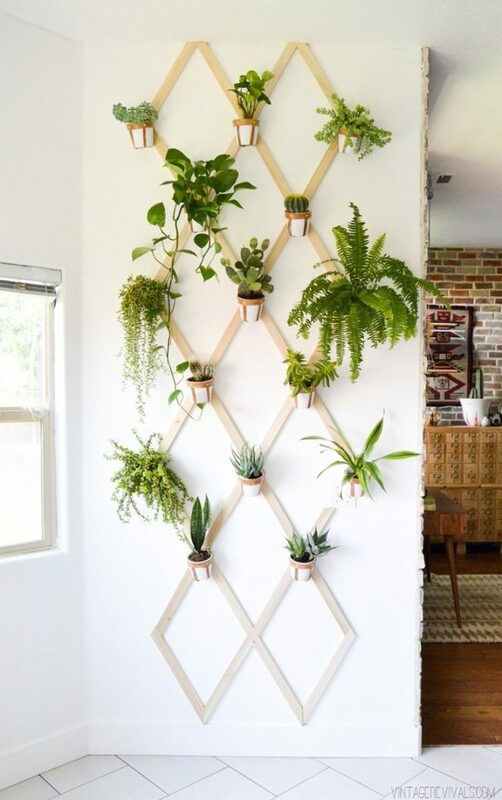 Add some greenery where it’s possible and you’ll probably find yourself feeling more grounded day-to-day (plants do that). If you’re looking for a unique way to do this and utilize a small wall, check out this DIY indoor wood and leather trellis from Vintage Revivals. Boho Vibe is very congruent with small boutiques and galleries, because they are less-likely to hold back on artistic flair. So, you may want to skip the big box and chain stores, and go straight to a small business. We are in love with the décor from Alyse Studios. 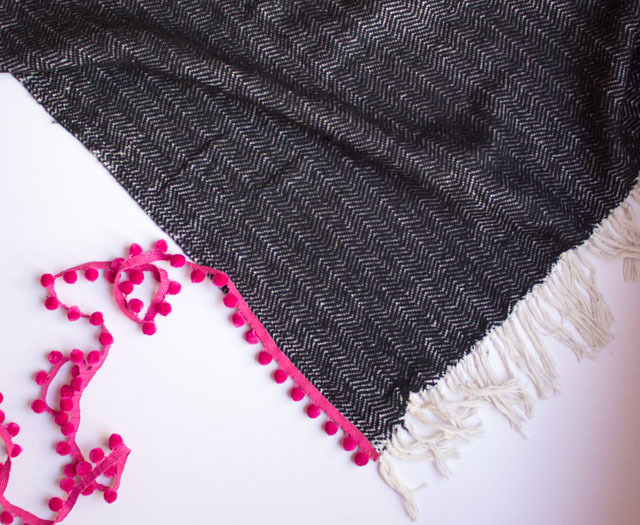 The owner, Alyse Rodriguez, enjoys creating art and sourcing textiles from around the world. 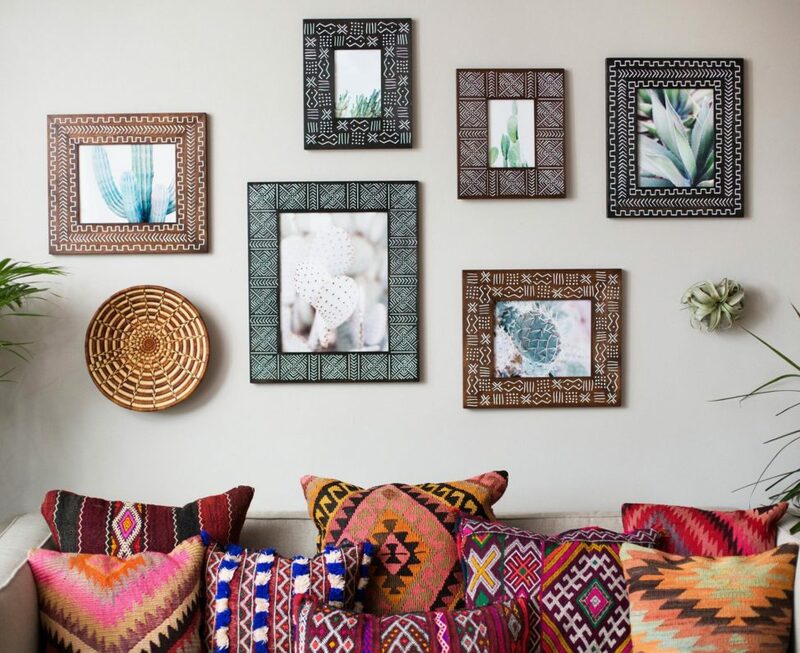 Her paintings, rugs, picture frames, and pillows feature bold colors and patterns that are sure to bring the culture-rich Boho vibe to your home. If you can’t find what you’re looking for, make it! Haeley at Design Improvised took existing pillows and blankets, and added colorful embroidery and fringe to make them more of a Boho Vibe style. Visit her blog to see the complete project, including her Colorful Boho Bedroom. Want more Boho décor ideas? Visit our Pinterest board. 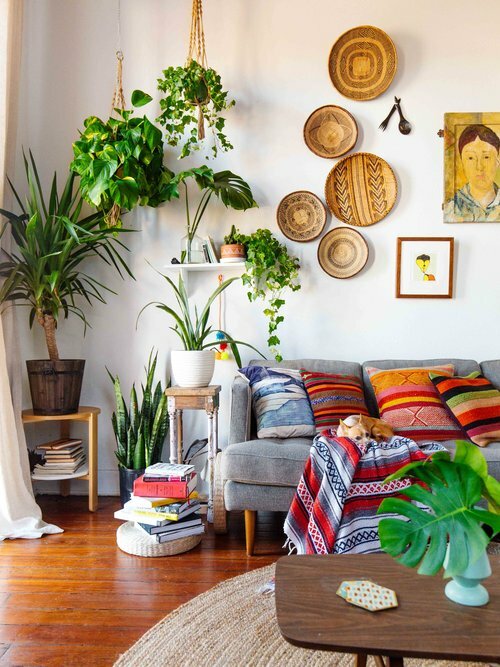 Is your home décor Boho Vibe? 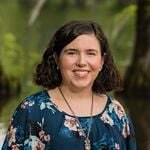 Have some favorite examples? Share them in the comments!